On a wall in the New London Museum, a blackboard bears a seemingly innocent lesson to be studied by a classroom's children on March 18, 1937. "Oil and natural gas are East Texas' greatest mineral blessings. Without them this would not be here and some of us would not be here, learning our lessons." Within minutes of dismissal time, the classroom collapsed with the rest of New London's school in a natural gas explosion that killed more than 300 children, teachers and other school personnel. The lesson for the day was still written on the blackboard when workers reached the classroom. As he tried to find his son, a worker erased the words. Poignant stories such as this are found throughout the Museum, the loving creation of people like Mollie Ward, who witnessed the New London explosion, and the families of others who either died or also survived the explosion. On another wall is a small red penknife that belonged to Perry Lee Cox, who had played hooky with sister Bobbie Kate on March 18. Their father caught them and sent them to school. When the school exploded, Bobbie Kate narrowly missed being in the building, but the blast blew Perry Lee out of the building. His parents searched everywhere and around 8 p.m. that night, they heard that a young boy carrying a small knife painted red with fingernail polish had been taken to a doctor at Arp. The family found Perry Lee around 9 p.m., but he died ninety minutes later. Mr. Cox never forgave himself for sending Perry Lee to school. He died of a broken heart in 1971. Overton businessman Bud Price, the brother of music teacher Mattie Queen Price, rushed to New London when he learned of the explosion. Unable to find his sister's car, he assumed she was safely at home. That morning, Mattie Queen had told Bud she would come home early that day with something important to tell him. As he walked her to her car, he noticed a pair of wooden shoes on the front seat. Assuming Mattie Queen was unharmed, Bud joined the rescue effort. As he walked by a car covered with dust and debis he looked inside and saw the wooden shoes. Mattie Queen was also inside, crushed by a large slab of concrete. Bud never learned what she planned to tell him. 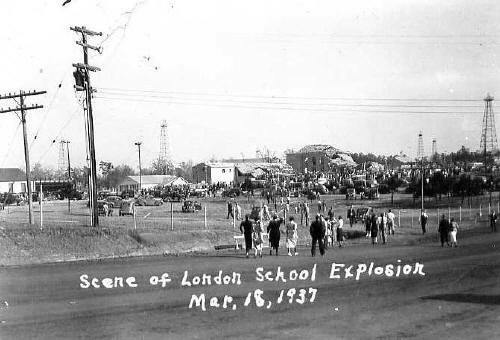 Even though the New London school explosion occurred nearly seven decades ago, not all of the victims like Perry Lee Cox and Mattie Queen Price have been identified. The disaster claimed the lives of more than 300 individuals, but the New London Museum--which has devoted much of its research to the disaster--is still finding burial sites as far away as Illinois and Missouri. The reason lies with the hundreds of transient oilfield workers who migrated to East Texas during the Great Depression to work in the oil and gas fields surrounding New London. When the explosion occurred at 3:05 in the afternoon, many of the transient workers rushed to the school, found the bodies of their children, gently placed them in their automobiles, and returned to their hometowns without notifying anyone. Today, Museum officials have identified 319 victims and continue to search for additional graves. Their efforts have taken them all over Texas and into six other states. And on the walls of their museum, they're still collecting personal stories from that heartbreaking day in 1937.